NEW YORK -- Where Second Street dead ends with the Gowanus Canal, a New Yorker comes face to face, but hopefully not hand to water, with a slice of the old city and the industrial waste it left behind. Polycyclic aromatic hydrocarbons, polychlorinated biphenyls and pesticides lurk near the bottom. Cholera, typhoid, typhus and gonorrhea float above. Save for a few adventurous canoeists, it's not usually an invitation to a walk on the waterside. But as the decades-long cleanup of the Gowanus Canal begins, one landscape architect is trying to turn a slice of Brooklyn into a "Sponge Park." The city's Design Commission approved the idea on January 30. The plan is separate from the EPA's Superfund cleanup of the "black mayonnaise" caking the bottom of the canal, which will have to be dredged. But it could stop the Gowanus from getting any worse. The Sponge Park is part of a larger effort underway in New York to use "green infrastructure" instead of costly pipes and tunnels hidden underground to catch storm runoff. City officials are hopeful they can save some $2.4 billion over 20 years, while also sprucing up the city's open spaces, with the new approach to sewage. The problem started in the 19th century, when New York City built an extensive network of combined sewage overflows (CSOs). At the time, said New York City Department of Environmental Protection Commissioner Carter Strickland, it was "state of the art." But the pipes came with a catch: when it rains, the system is overloaded and water gets dumped straight into the city's rivers and harbors. As water hits asphalt, pavement and roofs, it speeds up and carries away whatever dirt or motor oil might happen to be sitting around. Because of New York's CSOs, some 27 billion gallons of raw sewage and storm run off into the harbor each year, according to Riverkeeper. These days, most cities build a separate system of pipes for stormwater, so a heavy rain won't stink up the whole town. Building a second set of pipes would be wildly expensive. And according to Susannah Drake, the landscape architect who conceived of Sponge Park, it may not be necessary. Her plan is to turn much of the 1.8 miles of Gowanus riverfront into a giant permeable "sponge" for the stormwater. "If we can make the ground more permeable, we'll have fewer combined sewage overflow events, so we'll have less sewage entering the harbor, and that makes for a cleaner harbor," said Drake. 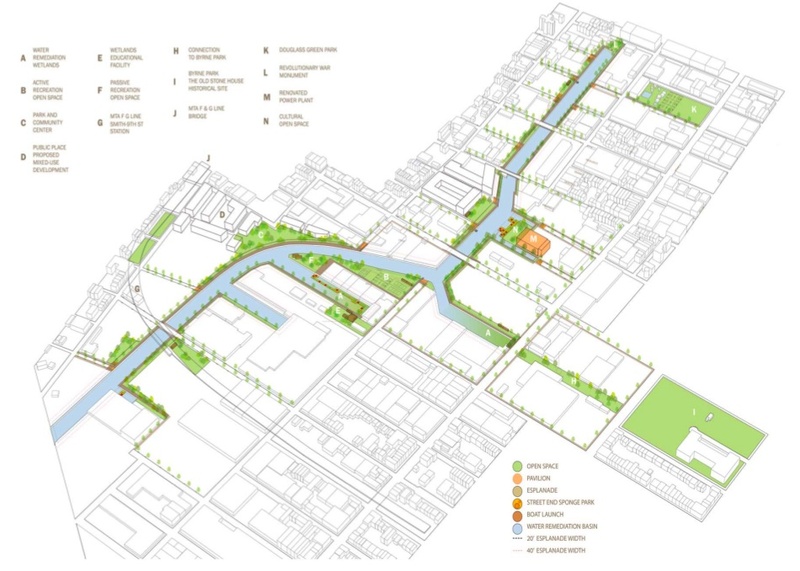 The Gowanus master plan from dlandstudio. With $1 million in commitments from the city and other sources, Drake and fellow architect Yong Kim have started on the first phase of the park, a series of sidewalk "bioswales" leading up to a "bioretention basin" at the end of Second Street. Put together, they estimate the mini-parks will be able to catch 4,500 cubic feet of water rolling down just this one street on a rainy day. That's enough to cover nine out of ten storms that hit the city. Planting should begin in the fall, with elements chosen from a "palette" of tulip poplars, northern blueflag iris, holly, yarrow, honey locust, American sweetgum, switchgrass and more. "We're using plants that can withstand periodic inundation, and also help to remediate some of the toxins in the soil, and also can withstand occasional drought," said Drake. Sunflowers look great, and they can also help neutralize heavy metals. Sassafras can manage stormwater, and according to Drake, "it's really interesting for kids, because it has three different kinds of leaves as it grows." With a few more parts of Sponge Park in place, Drake said, people could start seeing the beauty of the landscape -- both natural and industrial. "Canoeing on here in the summer is just, it's beautiful. There are places where the bulkheads just completely come alive with the plants that are starting to grow on it." "In a way I feel like we're going back to Olmsted now," she said, referring to Frederick Law Olmsted, one of the designers of Central Park, "recognizing that the landscape can have tremendous power in the city to work to help us with a lot of the infrastructure systems, and that cities can be so much more environmentally productive." The city, too, is getting in on the act. Further up in the canal's watershed, at Dean Street, the city recently installed four bioswales, tree pits that will stop and clean 1,870 gallons of stormwater apiece. They are test runs for what Strickland hopes will become a city-wide network. "We're really hoping to crank these out and put them in place very cheaply," he said, with up to 100 in place by the end of 2012. In 20 years, he projects, there could be thousands. If New York City can mass produce bioswales and other green infrastructure quickly enough, it may be able to save billions on what Strickland calls "tanks and tunnels," which in turn lead to extremely expensive sewage treatment plants. Traditionally, the EPA insisted on building such "gray" infrastructure. Questions have been raised about whether new, "greener" infrastructure would be less effective than older technologies. Yet the agency, along with the state Department of Environmental Conservation, has been more and more open in recent years to smarter, cheaper and better looking alternatives. "I think there's some healthy skepticism at the state and federal level saying "prove it," and we're willing to take up that challenge," Strickland said. The city is also still spending money -- $1.6 billion over 20 years -- on the "gray" stuff, including upgrades to a flushing tunnel that pushes water from the cleaner East River through the Gowanus. Between the city's tunnel, the EPA's dredging plans, and her Sponge Park, Drake said, "it might mean that my grandchildren -- and I think it will take that long -- that my grandchildren can actually swim in the Gowanus. Without dying."